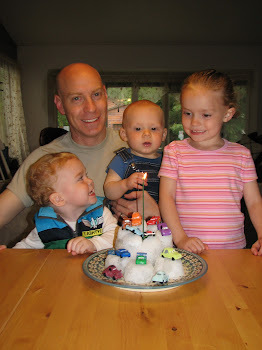 Orland's Overture: Fun with CURLS! So I have learned with curls that it is not so much as you training the curls what to do but that they train you how to do the hair with however they curl. For those of you who have never dealt with curly hair you probably think I am crazy for thinking that your hair can train you. Let me tell you it is TRUE! 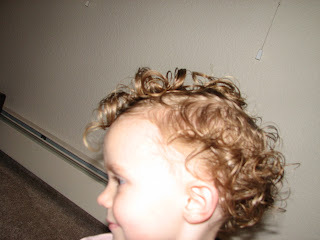 With Isabelle we put a little product in her hair and then style it with however the curls react. Today was fun because her curls just fell into a Faux Hawk! The pictures don’t do the 3-dimensionality of it justice. 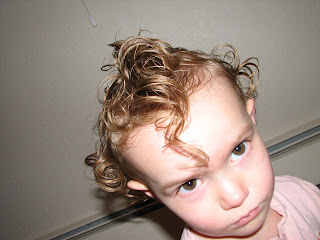 Sometimes curly hair drives me nuts! Then when you least expect it... it's a BLAST! I love her face, it screams "Mom, are you really taking a picture of me? 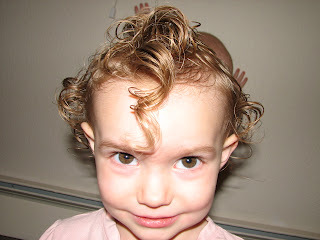 ", Isabelle you look so adorable with your curls! She absolutely was thinking THAT! Hee Hee. I have become one of those parents like in movies that constantly have a camera near by and are video taping everything and the kids are annoyed. I just want to share our joy with everyone and realized that a picture is worth a thousand words! This is one amazing hairdo! I think I'm going to have to adopt the philosophy of having the curls train me b/c Ali has curly hair and so far I have not been able to tame it. Most days it's just one frizzy pooof!